New Lamy In The Mail! Once again, it’s been far too long since I’ve updated here. Actually, due to just “life stuff”, I haven’t done much with my pen hobby at all – other than write with them. But today, an internet purchase came in the mail, so, a good time to update with a review. First, here’s a link to their US web site, http://www.lamyusa.com . Specifically, This review will focus on the Safari and Vista models. 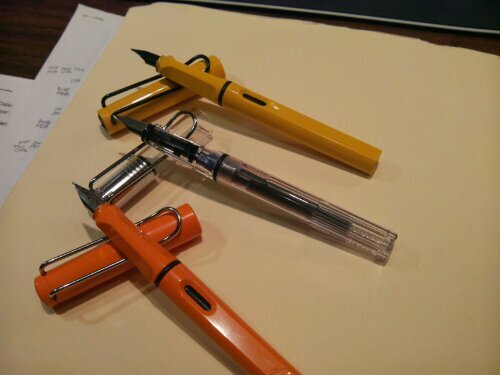 They are basically, the same pen, the only difference being that the Vista is a clear demonstrator, while the Safari’s are colored ABS plastic. I already owned two limited edition Safari’s, an orange and a banana yellow one with black appointments. As I mentioned earlier, the two models (Safari and Vista) are identical. In fact, a third model, the Al-Star, is also the same pen, but manufactured in multiple colors from aluminum. The pens are 5 1/2″ capped, and apx 6 9/16″ posted. All three of these lines use a universally exchangeable nib system. The nibs are simply friction fit, and slide into their respective pen sections. Nibs are offered from the company in a wide variety of widths, mine are fine and medium. Depending on the color scheme of the particular pen, the nib will be steel and either chrome or a black plating. The nibs on my pens are all very smooth, but do offer a bit of feedback as you write. This is hard for me to accurately describe. I have some pens that I refer to as buttery smooth. These pen nibs are so smooth as to almost feel slick. Almost as if you were writing on ice. 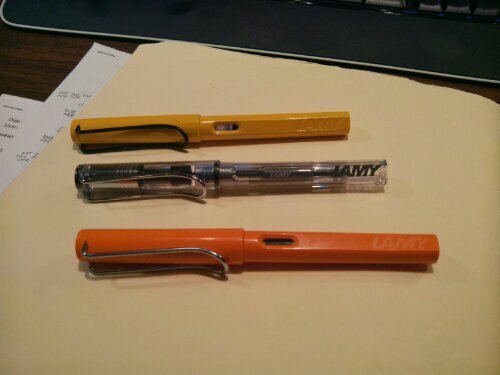 I would describe the Lamy’s as “toothy”. They are smooth, but not slick. You “feel” the paper (to a degree) as you write. Thumbs up. Aesthetically, they’re not for everyone. They definitely have a “modern” look and feel to them. The sections are contoured and molded with 2 flat areas at angles on the otherwise round section. This can take some getting used too, and though I know many may not like it, I have come to really like it. The body of the pens also incorporate 2 flat panels onto the opposing sides of the otherwise round bodies. While I don’t know if it was on purpose, practically this is nice because when you lay the pen down, it won’t role off of a table. There is also a small notched window opening allowing you to see when you’re about to run out of ink. Though on the Vista model (the clear demonstrator model), the notch is useless as you see all the internal workings of the pen. Overall, you get a sleek and modern profile. For old school fountain pen purists, these pens may be too modern in appearance. But boy it’s hard to argue about how they write. 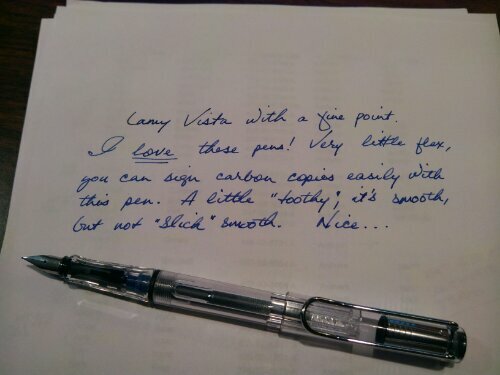 Lamy has done a fantastic job with the quality of these pens, especially when you consider their price points. All of the models I’ve mentioned can be purchased online from about $20 to $45 depending on the source and the model chosen. The aluminum Al-Star models command the highest prices. All pens can be filled with either a cartridge or converter These pens may not be for everyone, but they sure are for me. 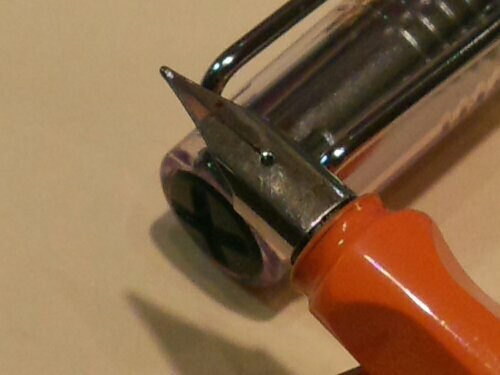 Author Will IsaacPosted on January 31, 2013 January 31, 2013 Categories Fountain Pens, Lamy Fountain PenTags Fountain Pen, Lamy1 Comment on New Lamy In The Mail! Tonight’s subject is a reposting of an article by Jim Mamoulides outlining the history of Eversharp pen company’s Skyliner line of fountain pens. In 1940, the Wahl company reorganized under the Eversharp name, which was better known in the marketplace because of the continued success of the Eversharp pencil line. The Eversharp repeater pencil, introduced in 1936, was really driving sales and profits for the company, which had fallen far behind Sheaffer and Parker in total sales revenue. A new line was needed to spur sales and regain market share. Eversharp engaged industrial designer Henry Dreyfuss (1904-1972) in 1940 to design a new line of pens and pencils. This new line would take advantage of Eversharp’s repeater pencil success and its reputation for making high quality nibs, but would be a move away from the Art Deco influenced designs and gimmicky features introduced by Wahl Eversharp in the late 1930s. . The line was unveiled in the spring of 1941 as the Skyliner and supported by a heavy advertising campaign. The name evoked the excitement of air travel and early advertisements proclaimed “Magic Feed prevents ink flooding or leaking high in a plane…so of course at ground level, too.” Eversharp quickly shortened the name to Skyline, probably within the first year. Interestingly, Eversharp returned to the Skyliner name in advertisements by 1946 and appeared to use that name until the line was retired. The Skyline pen is a conventional lever filler with a radical streamlined design, a Dreyfuss hallmark. Some have noted that the pen shows strong influences from the Dreyfuss designed New York Central 20th Century Limited streamline locomotive. Several have pointed out that the pen, when viewed top down, has the same dome shape as the front of the locomotive and tapers off as the train would into the distance. The clip favors the smoke blowing from the smokestack to the back of the train. The design looks very top heavy capped, especially on the smallest models, but becomes very balanced posted. The nibs have the typical very smooth writing qualities expected from earlier Wahl Eversharps. Though available in a wide range of styles and flexibility, they generally aren’t marked with size or flexibility. The over the top clip design made the pen eligible for sale to the military, as it sits quite low in the pocket. The earliest Skylines have visulated sections. Dreyfuss also designed the rotary telephone in 1937. It is said that the taper tip of the pen is designed to double as a phone dialer. Some references say the pen was shown in the Museum of Modern Art in New York as part of an industrial design exhibit. The Skyline was a huge success for Eversharp, eventually becoming, by 1945, the best selling pen in the USA. Skylines faded from Eversharp advertising after 1945 in favor of other models such as the Fifth Avenue, but was produced until 1948, when the Symphony was introduced. Skylines were produced in a broad variety of colors and cap types. It’s almost as varied as Parker Vacumatic typing. The earliest Skylines, probably the first one or two years, have a black visulated section and an ink drain, rather than the later breather tube. The breather tube was a big improvement in maintaining even pressure balance inside the pen to prevent leaking. Later Skylines usually have a section that matches the barrel color. Three pen sizes were made, Demi or Lady, Standard, and Executive, which are about 4 3/4 inches, 5 1/4 inches, and 5 1/2 inches long, respectively. The caps on the two smaller models are threaded the same and can interchange, which can create new “models” and variations. The Executive model is actually very uncommon and will command a high price from collectors. All models had matching repeater pencils. The pens sold in a wide price range, from low-cost all-plastic pens to all solid 14 karat gold models: pens from US $3.50 to $125.00, pencils from US $1.50 to $75.00, and pen and pencil sets from US $5.00 to $200.00. An ill-fated ballpoint, the CA (for “Capillary Action”) was also made. The double check mark on the clip indicated the pen carried the Eversharp lifetime warranty. All Solid Color Plastic Cap and Barrel: These were the cheapest Skylines and are solid color pens in with the cap and barrel in all black, green, navy blue, brown, dubonnet (burgundy), or silver gray plastic. The cap may be smooth or have radial engraved lines. The derby is plastic and matches the body color. Trim may include a thin or wide cap band. Wide cap band pens are the least common. All solid color pens came in all sizes, but the Executive size was made only in black. One version of the all-solid pen has the half or short clip, no cap band, and was the least expensive model. The clip on these pens stops at the derby, instead of going over the top. These low-end pens were made in the standard size only. Trim is gold filled. Early price sheets show solid color pens in both Men’s (standard) and Ladies (Demi) sizes at US $3.50 and matching pencils at US $1.50. Pen and pencil sets listed at US $5.00. By 1946, solid color pens were, in both Men’s (standard) and Ladies (Demi) sizes, US $5.00 and matching pencils at US $3.75. Pen and pencil sets listed at US $8.75. Modern Stripe or “Moire”: Models with single color longitudinal striped caps and barrel in silver gray, green, blue, red and brown. The Modern Stripe pen came only in the two smaller sizes. The color stripes are wider than alternating black and have a radial grain. Three styles in order of price, lowest to highest: no cap band with derby cap matching body color, narrow gold filled cap band with derby cap matching body color, and wide gold filled cap band with gold filled derby cap. The plastic derby color matches the barrel color. Trim is gold filled. The Modern Stripe pens were also low price entry level pens. Early price sheets show solid color pens in both Men’s (standard) and Ladies (Demi) sizes at US $3.50 and matching pencils at US $1.50. Pen and pencil sets listed at US $5.00. Striped Celluloid Cap: Models with longitudinal striped celluloid caps in all three pen sizes. The cap stripes are alternating color strips that are all the same width. The cap color and the derby match the barrels, which come in solid black, green, navy blue, brown, dubonnet (burgundy), and silver gray. Trim is gold filled. This is the only Skyline model that has problems with discoloration. Advertisements from 1943 show celluloid cap pens in both Men’s (standard) and Ladies (Demi) sizes at US $5.00 and matching pencils at US $3.75. Pen and pencil sets listed at US $5.00. By 1946, celluloid cap pens were, in both Men’s (standard) and Ladies (Demi) sizes, US $5.00 and matching pencils at US $3.75. Pen and pencil sets listed at US $8.75. Presentation Gold-filled Cap: Caps have a gold filled overlay and have either radial (the most common pattern), or more rarely, longitudinal engraved lines. These pens are also known as “Presentation” models. These pens were made only in the standard and Ladies or Demi size. The derby is plastic and matches the barrels, which come in solid black, green, navy blue, brown, dubonnet (burgundy), and silver gray, or the derby is gold filled. Trim is gold filled. Early price sheets show Presentation pens in both Men’s (standard) and Ladies (Demi) sizes at US $8.75 and matching pencils at US $4.00. Pen and pencil sets listed at US $12.75. By 1942, the pen and pencil set was $14.75. Stainless Cap: Caps are all gold filled and have either radial, or more rarely, longitudinal engraved lines. No cap band. These pens were probably made only in the standard size, but mismatched Demi pens would be impossible to tell. The derby is plastic and matches the barrels, which come in solid black, green, navy blue, brown, dubonnet (burgundy), and silver gray or the derby is chrome plated. Trim is chrome plated. Stainless capped Skylines are very rare. Early price sheets show stainless cap pens in only the standard sizes at US $11.75 and matching pencils at US $2.00. Pen and pencil sets listed at US $13.75. Sterling Cap: Caps are sterling silver and have either radial, or more rarely, longitudinal engraved lines. No cap band. These pens were probably made only in the standard size, but mismatched Demi pens would be impossible to tell. The derby is plastic and matches the barrels, which come in solid black, green, navy blue, brown, dubonnet (burgundy), and silver gray or the derby is chrome plated. Trim is chrome plated. Sterling capped Skylines are rare. Vermeil Cap: Caps are sterling silver with gold plating and have either radial, or more rarely, longitudinal engraved lines. These pens were probably made only in the standard size, but mismatched Demi pens would be impossible to tell. The derby is plastic and matches the barrels, which come in solid black, green, navy blue, brown, dubonnet (burgundy), and silver gray or the derby is gold filled. Trim is gold filled. Vermeil capped Skylines are very rare. All Metal: Caps and barrels in gold-filled, sterling silver or vermeil. Numerous engraved or machined patterns, including radial lines, longitudinal lines, and chevrons, reminiscent of the machined pens of the 1920s, as well as plain (smooth). No cap band. Vermeil and gold-filled pens with radial engraved stripes were also known as “Gold Award” pens. All metal pens were probably only made in the Standard and Demi size. The derby and trim is gold filled or chrome plated to match the pen finish. All metal Skylines are uncommon. Early price sheets show 12K gold filled cap and barrel pens in only the standard sizes at US $13.75 and matching pencils at US $6.00. Pen and pencil sets listed at US $19.75. By 1942, the Gold Award pen and pencil set was advertised at $22.50. Command Performance: An all solid 14 karat gold cap and barrel model, advertised as “Command Performance” was also offered for US $75.00. This model was probably only made in the Standard size. Advertisements show a plain or smooth body pen and pencil, though it is possible that engraved or machined patterns were offered. Called the “gift of a lifetime” by Eversharp. Of the all metal Skylines, smooth 14 karat gold models are the most common, and generally are not considered rare. The matching solid 14 karat gold pencil was US $50.00 and the pen and pencil set was US $125.00. Solid Platinum: An all solid platinum cap and barrel model is catalogued, offered for US $125.00. This model was probably only made in the Standard size. The matching solid 14 karat gold pencil was US $75.00 and the pen and pencil set was US $200.00. Wahl Skylines: Some models will have the Wahl name engraved on the clip instead of Eversharp. These models are uncommon. It is believed that Wahl produced these pens to maintain the Wahl name as a trade name. There is no other difference between these pens and other Skylines. Modern Reissues: In the 1990s (1992-1995) there was a series of reissued cartridge / converter Skylines. These included a chrome and gold plated cap model similar to the silver and gold radial engraved capped pens from the 1940s. There was also a “demonstrator” limited edition model, a “Yellow Cab” (in all yellow plastic) and “Fire Engine” (in all red plastic) model that came with a toy car or truck. A very expensive U. S. Army Air Corps Commemorative Limited Edition was released made from aluminum from World War II era fighter planes. The Eversharp company had long ceased to exist, so these models are more commemorative than authentic issues from the original company. Skylines are prized by many collectors and the many variations of the pen and the large production run has meant that many of the pens survive today. Unfortunately, Skylines are known to have problems with plastics shrinking and becoming brittle, making some pens risky to open to replace sacs, for fear that they will break. Some pens with plastic derbies have had problems where the derby has shrunk making the trim loose. Beware glued derbys. They were made to unscrew, and this method predicts later problems. The design makes posting the cap a constant wear on the lever, resulting in brassing. They don’t tend to have body cracks from posting, however, a testimony to the telephone dialer design. Dating Skylines is probably a lost cause, unless you have a visulated section pen. Some of the very first pens had two tone nibs. Eversharp did not use date codes on the pen and the fact that there are so many variations really makes a specific year dating impractical. Skylines are generally easy to find and haven’t gone through the outrageous price acceleration as other pen lines. I tested a Standard size gold cap Skyline with a brown plain barrel and Standard size gray Modern Stripe Skyline. Both of the pens tested have very smooth and wet writing medium nibs. Being Standard size, both pens measure out at 5 1/4 inches long capped and post deeply and securely at 5 5/8 inches. These pens post well and have excellent balance. The military clip design makes the pen sit low and snug in the pocket. 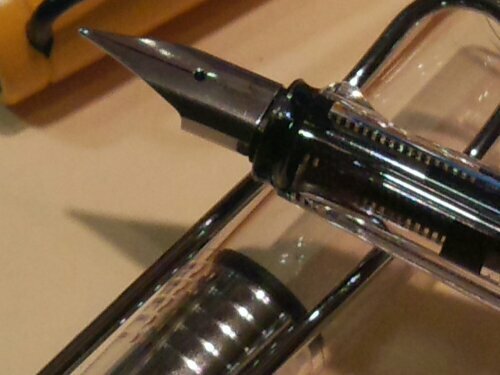 The pens fill easily with a single stroke of the lever and ink the paper immediately with a smooth wet line. The gold cap pen is a bit pedestrian looking next to the Modern Stripe, which to me is a wonderful plastic. The detailing on both is excellent, as these were both found as problem-free pens. In daily use, these are great writers and should make anyone’s rotation if usability is the criteria. Skyline variations abound, but certain models are going to attract the most attention and money. The Modern Stripe pen is very uncommon, sought after by collectors, and commands a relatively high price. On the other hand, the solid gold and gold filled pens generally go for less than comparable models of other brands made from the same materials. Beware dings in all-metal pens. A pricey pen will be the stainless cap model. Very rare. Collecting Skylines should be rewarding. There are a lot of them out there and a decent and varied collection can be had for less than some other, more popular pens.